Military Working Dogs: No retirement plan for these heroes. | Crockett Foundation - Tag In & Help Out! Military Working Dogs: No retirement plan for these heroes. Always Faithful is an outstanding full length documentary about US Marine Corp dog teams serving in Iraq and Afghanistan. It’s remarkable to see the ties these active duty Marines have with their military dogs. There’s a story about an injured Marine being taken away for surgery and insisting that his dog be by his side every step of the way – and during surgery. The surgeons complied. This is a film I know I’ll view again. I’m fascinated by this stuff. Curious civilians, like myself, want to know what happens to military dogs when they retire. The US Department of Defense (DOD) calls them Military Working Dogs (MWD) – and they’re property. The dogs are equipment used to get a job done. These military dogs are trained as specialists. Some search for our deceased warriors’ bodies in those combat zones. Others search for chemicals and other materials used to create explosives. Each MWD is attached to a particular unit of troops, and the military dog deploys and then returns with their handler in that unit. Lackland Air Force Base (LAFB) in Texas is where the 341st Training Squadron is responsible for training these military dogs. And those dogs who go off on their own to do their jobs alone, where humans aren’t able to go – searching for our missing service members. Some are the bomb sniffers. These are the dogs who move ahead of the rest of the troops to detect the slightest scent of chemicals and materials used to make explosives. The dogs that move with a handler step by step – far ahead of the unit of men and women in the distance behind them. Imagine that trust and every day closeness between the human warrior and that canine soldier. When the dog retires, if the military handler wants to adopt the dog there’s no funding to get them back home. Fortunately, to the rescue, there are some very special non-profit charities for Veterans out there that pay to bring these dogs home to the US for retirement as part of a loving family. So, what happens if the dog heads back to the States – while the handler is still on active duty overseas? A lot of people here in the United States want to adopt these canine soldiers. We’re a nation of dog lovers. We adopt dogs. We rescue dogs. Some of us even sleep with our dogs. And, we’d like to show our appreciation for the freedom we have enjoying life on American soil by caring for retired military dogs as part of our family, as our new pet. Here’s a good thing: over 90% of retired military dogs are adopted by their handlers. With only 10% of these military dog soldiers needing to be adopted by someone other than their handler, there seems to be no need for the public to have easy access to the actual application for adoption. For those that do submit an application, there’s usually a wait of at least 6 months before a dog becomes available for adoption. If you’re interested, we’re told applications can be obtained from the Lackland Air Force Base MWD Adoption Program. 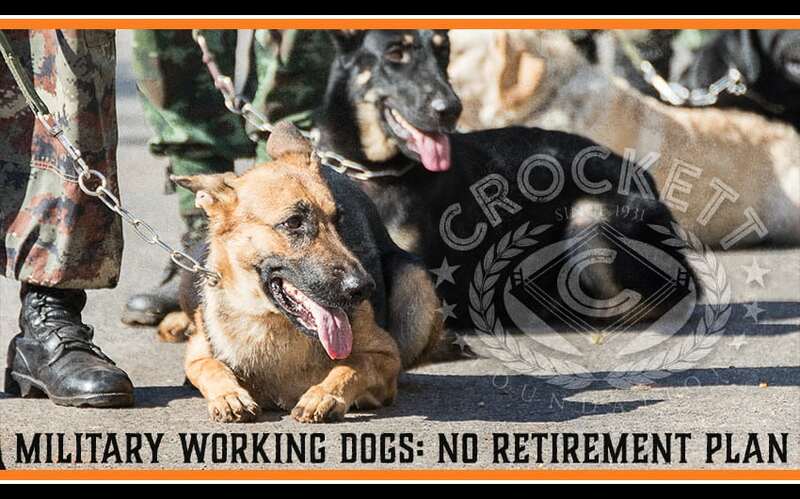 You can help military dogs by donating to the Crockett Foundation. It’s a large financial commitment to take on the Veterinary bills to care for an aging dog. The Crockett Foundation is very excited to give financial support to cover these costs as well as everyday costs of living including food. If you know of a retired military dog in need of help with these costs please contact us to see if there’s a way we can help.